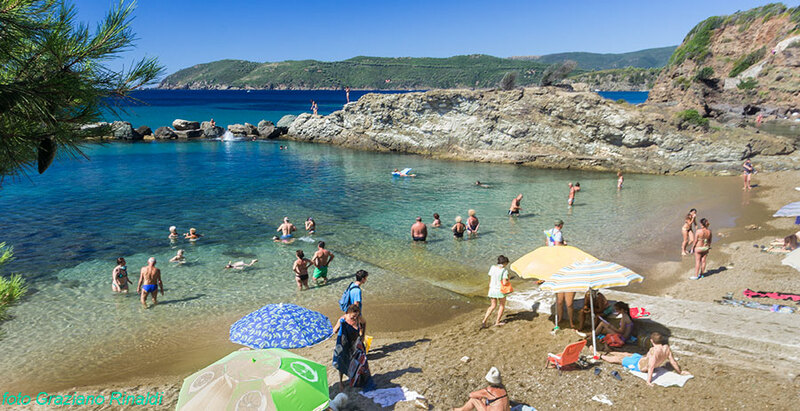 The inhabitants of the island of Elba talk about it as if it was an exotic beach, difficult to reach and a bit mysterious. Felciaio is not any of those things, better to ask what is this beach, as it is four small creeks one after the other, but it’s a rhetorical question, because for everyone here, Felciao means the two central bays. This stretch is on the south coast, well within striking distance of the stately Gulf of Stella with the island of Montecristo in a straight line in front. Personally I only go in winter, when it is completely deserted, it’s not crowded even in summer,, but it’s size is so small it’s easy to fill it up. To find it you take the road between Porto Azzurro and Portoferraio, at “La Fontanella”, where the road widens and where Anna’s fruit and vegetable stall is (which I highly recommend), follow a lopsided sign indicating “Lido Felciaio”. You have to drive along a narrow paved road flanked by holiday homes and apartments for about 1 km, then another sign even more improvised and this time written by hand, indicates the beach. There is a large car park for the car and then you may decide to walk along the path at the top, or the one between the bushes to the sea. Almost all of the people prefer the latter which is shorter and quite pleasant as a short stroll in the country takes around 5 minutes. Just beyond the dense evergreen vegetation, just thirty feet below you, is the first cove. Normally the first part is passed without ceremony, in fact even in summer it is the only part of Felciaio where there is no one around. As there is a steep path to walk down and although the cliff is not very high, most people avoid it. Even the space to lay out is quite small and there is not much privacy, as anyone there can be seen easily from the higher trail. Even if you decide to go further, this first glimpse of sea and rock will offer you a great introduction to what is waiting for you a few dozen yards away, where a narrow beach of golden sand and shallow clear waters will suddenly appear under the astonished gaze of one who has never been on this beach. You will also find a small bar, but if you don’t not like the soft and high layer of dry leaves of Poseidonia that generally occupies two thirds of the beach (this depends on the intensity of winter storms), Felciaio isn’t for you. The immense gulf that welcomes you onto the beach is covered by a lush grassland of this marine plant (do not call it seaweed! when it is not alga, you do not say invertebrate to your dog do you?) that, swept by storms, forms a quantity of dry leaves on the beach, which, year after year accumulate and despite occasional human intervention, tend to stratify, making stable packages of pressed leaves. Here you will find mothers with small children, the water is clear and the seabed extremely low, so the water is usually warmer than elsewhere as long as the sun shines. Interesting blocks of pink marble emerge from the end of the yellow sandy beach, although sometimes they are invisible because of the submerged leaves of Poseidonia. The other cove is the busiest, it was made with large rocky boulders stretching out from end to end, so you get a cove sheltered from any wind, even from the Scirocco, from which this part of the island is always squarely hit. At the centre, on the waterfront there is a tall, mysterious building with a slide of cement that reaches the tiny harbour where you have the opportunity to repair small boats indoors in the winter.. 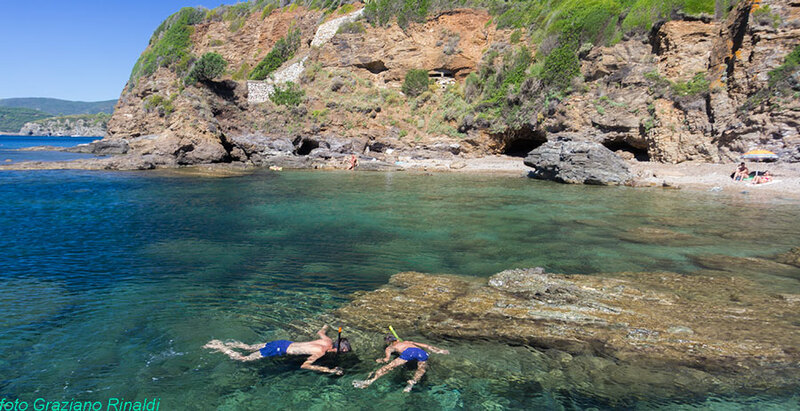 The beach is dominated by a few large villas and there is a big high rock that separates this third cove from the other side of the beach where it is ideal if you like to dive, it’s not too high and the sea here is always crystal blue. Now you can explore the final area of the beach which is also the rockiest, it is not in fact a real beach, rather a few splashes of fine pebbles scattered in the heart of a cliff made inhospitable by the unexpected yellow veins of sulphur crystals, but this is also its charm. Among the recesses of the cliff and small shelters dug from the sea in the shape of tiny caves, you can find shelter and enjoy a glimpse of the sea from a different and wilder perspective, but you’ll have to go early or be lucky enough to find free places. Despite the fact that Felciaio is a very popular tourist destination, it also has been able to preserve the primitive nature and wildlife with shades of darkness of this part of the island, I think mainly because of its rocks. They are among the oldest in Italy, through millions of years they have been burned and reshaped by intense metamorphism that makes them resemble those fossil forests in which it isn’t hard to imagine ancient monstrous animals that have by now disappeared from the face of the Earth, but not by from the archaic memory of man. The magic of the place and with such an active geological landscape, they give Felciao a special charm. I remember with nostalgia when, together with my daughter still a child, we collected pebbles of all colours smoothed by the sea, a real stone kaleidoscope made up of of a large and beautiful lithological variety in this place.